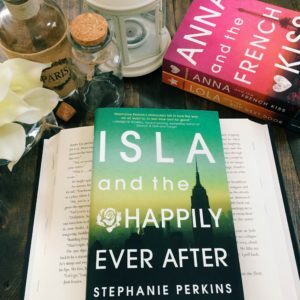 I was wary of starting Isla and the Happily Ever After, especially because the previous two books centered on characters already in relationships; that was just not cool to read about. Once I started, though, I was ecstatic when I kept reading Isla and the Happily Ever After and no one was in a relationship. Isla and Josh were both single and free to fall in love. It was the cute, contemporary romance I was waiting for. Hands down, no competition: Isla and Josh are my favorite couple that Stephanie Perkins has written about to date. Most of it is due to the fact that there were no prior relationships to worry about, but this is also due to the sweet emotions I had reading about Isla and Josh falling in love! They were cute, adorable, and had me reminiscing about the fun times of having a crush. Of course, it’s not always full of excitement. There’s also nerves, worry, and self doubt, which Isla and the Happily Ever After featured plenty of – maybe even a bit too much of at times (particularly in the insecurities department). This book was well onto its way of a solid high 4 stars for me until it reached its climax. Every book needs its conflict; no one lives in a fairytale forever and I kept wondering when Isla and Josh would hit their problems. I was so disappointed when they did! It made no sense to me that Isla would presume to tell someone how they feel. No one is a mind reader and not once did Josh’s actions ever prove the things Isla said to him. Her massive amount of insecurity drove me nuts. Not to mention the fact that she was so insecure about a relationship Josh was in well before they ended up together – her character was downright irrational at times. Sadly, the ending ruined a perfectly good book for me. I had such high hopes and even though Isla and Josh are my favorite couple, prior to their conflict, I actually enjoyed reading the cameo of Anna and St. Clair and Lola and Cricket at the end more than I did about Isla and Josh’s happily ever after.